What is the alternative for wilding conifer control, asks Jim Childerstone. Gerrard Eckhoff has made a valid point (ODT, 8.1.19). It gets extremely hard to discuss issues with people or organisations with fixed views or agendas. Particularly if the issue is even slightly controversial. He particularly targets the 1080 debate. There appears to be little compromise between the combatants. He may as well have mentioned the hardened attitudes regarding the battle controlling the spread of wilding conifers. To spray or not to spray, pest plant or resource. As one who has been involved with control and use of wilding conifers as a resource for more than 40 years, I find it hard to get into a practical debate on the problem. It gets to be too emotive. That these rapidly regenerating species soak up rainfall, suppress growth of other species, put paid to bird and animal life, are not pretty to look at and are detrimental to farming. In fact said to deter tourists, expecting to view open tussock country and native bush from their Queenstown hotel balcony. In reply to articles and letters I have written on the subject, there has been little or no response. It seems there is a consistent mind block among control groups or their adherents. The Wakatipu Wilding Control Group has managed to attract some local high rollers in support, such as retired financier Eion Edgar and Real Journey's director Bryan Hutchins. There had been little debate on the subject except for the 2017 referendum regarding the premature felling of the Coronet Forest. Those with forestry experience (a minority) were well outvoted when submissions were called for. Little had been forthcoming from the green lobby or Forest & Bird. This in spite of the widespread use of chemical spraying of infested areas. The variety of chemicals used has still not been fully developed to target specifically needle-type foliage. Thus spraying young outlier seedlings (which at one time were controlled through livestock grazing) are not advised, as it can affect native species. Spraying is carried out mainly on full canopy trees, said to be the most cost-effective method. Otherwise it's up to paid ground crew with knapsack sprayers, but some areas are unreachable. Or volunteers, which at least gets people out and about and making a social day of it. I'm all for it, having pulled wilding Douglas fir while trailblazing tracks around Ben Lomond. As Eckhoff puts it, it's impossible to discuss or have a conversation with people with fixed views. And up in the Wakatipu, the vast majority of the population would have little understanding of forestry in general. What concerns me is the millions of dollars being allocated through tax and ratepayers, and sundry organisations, in what is turning out to be an endless battle for control/elimination. And the oxymoron is that millions more dollars are being allocated to grow more trees (ref the Productivity Commission). A fallacy that seems to be promulgated by conservationists is that wildings have no commercial value. Many houses in the Wakatipu area were built using wilding Douglas fir, Corsican pine and larch milled in the area, much of it through my own portable mill back in the late 1970s. Both Corsican and lodgepole pine were in demand by Great Southern treatment plants due to the high-density stiffness of these invasive species. There is also scope for residue to be converted into biomass for heating as well as the extraction of essential oils. Also, under the emission trading scheme carbon credits, there is potential income if wildings can be registered. Enough, according to one forester, to fund complete control of outlier spread of all species. This could be one alternative to spending public money on a virtually no-win battle. The other, as advocated by many experienced foresters, is control through forestry management systems. That includes income from harvest operations, where possible, part of which is allocated to outlier control. Although the Queenstown Lakes District Council tends to play this down, small-scale select stem and coupe harvest operations on Ben Lomond have boosted council income in the past. 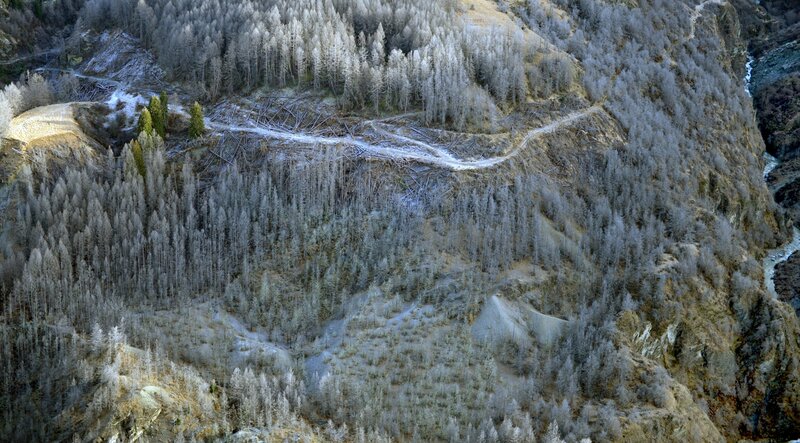 One logging operation nearly 20 years ago on a lower terrace involving approximately 2ha of clear fell and select stem removal netted the council $176,000. There had been several coupe harvests on other terraces giving a financial return for what had now developed into an amenity forest backdrop to the township. Having once owned several hectares of wilding trees (mostly Corsican pine) at Closeburn, I have consistently considered them as a resource. Part of this block I replanted with native shrubbery (coprosmas, pittosporum) and beech varieties. However, I left some larch for colour, a species, which also provides a backdrop during the Arrowtown Autumn Festival, that could be in for the chop. Back in the 1950s to 1980s, several of these invasive species were introduced into erosion-prone high country in Canterbury, namely, dwarf mountain pine (P. mugo), lodgepole (P. contorta), Corsican (P. nigra), ponderosa, Douglas fir and European larch among about 30 species of conifers. It was a 30-year Forestry Research programme. And it worked, probably too well. It prevented hillsides ending up in the Waimakariri tributaries during storm events. It stabilised slip areas and built up litter for regenerating some native species. As Gerald Eckhoff says, there are alternatives. Let's talk about it.